Nearly as soon was we submerged, to about 30 feet, this school of Mackerel Scad swarmed over our heads trying to escape some Bar Jack that were hunting them. A pretty nice way to start off the dive. 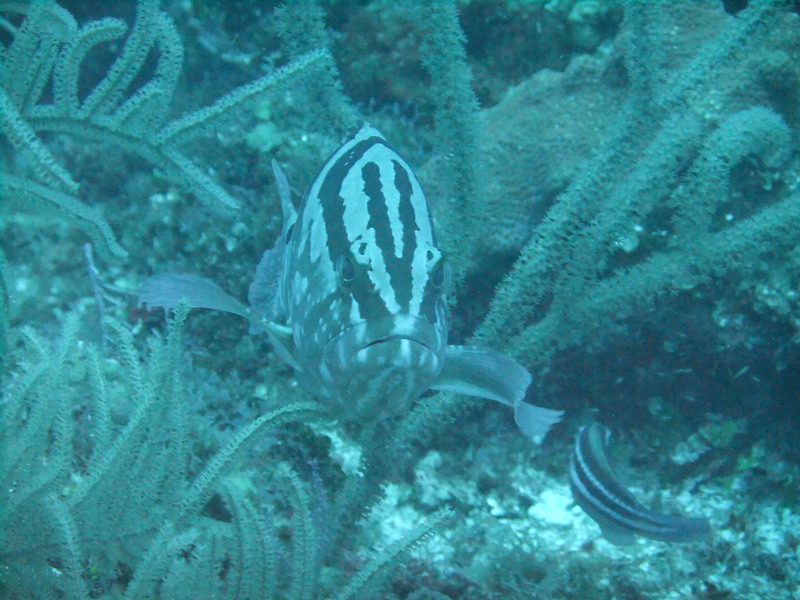 This is the endangered Nassau Grouper, identifiable by its fancy stripes. Overfishing and slow breeding have decreased this fish’s numbers to dangerously low levels. No-take zones like this one are helping the populations recover. This is our friend the elusive Caribbean Spiny Lobster, who as you can see likes hiding under rocks and coral. His excellent camouflage is really his only defense against those of us who like to eat him since this kind of lobster has no claws (just spiny antennae) to protect himself. 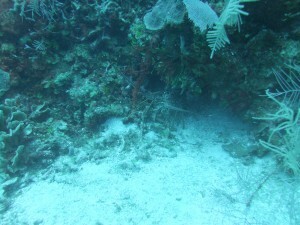 Luckily for him, taking lobster from this area is illegal as is scuba diving for them so he was safe. This is one of my favorite friends on the reef, the Grey Angelfish. These guys are really cool looking and can get surprisingly big (around 60 cm). They mostly hang out on their own and usually eat sponges. Mostly they’re just awesome to watch. Oooooh barracuda…we saw a lot of these guys during our time in the water around the island, and ate a few of them too. Their big teeth and creepy name have earned them quite a bad rep, but they really aren’t dangerous enough to get too excited about. 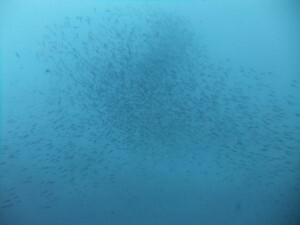 They mostly hunt schools of little silver side fish which is why people say to avoid wearing shiny jewelry if you don’t want to meet a barra up close, sometimes in very bad visibility they have been known to get confused and take a nip at something they didn’t mean to. 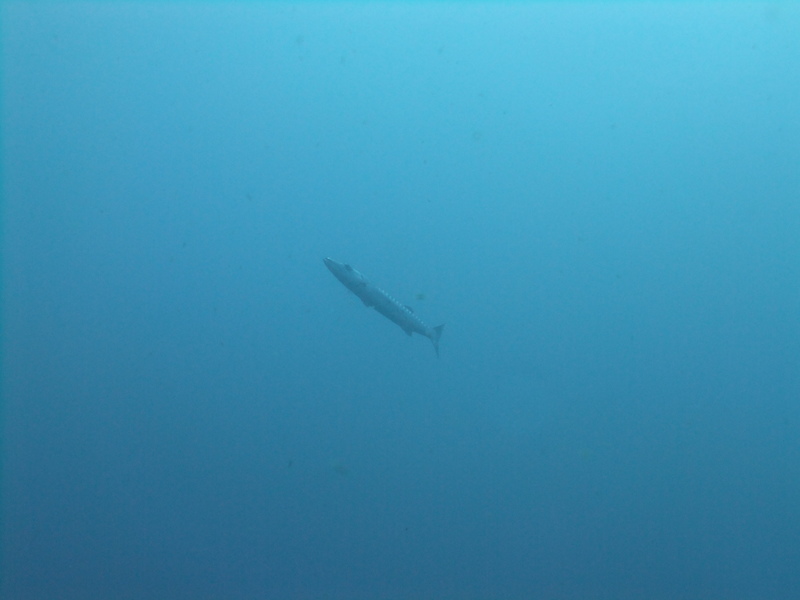 They also sometimes follow divers around thinking that they are larger predators that will leave behind scrumptious scraps for them to scoop up, this behavior can be discouraged by turning to face them and fixing them with a good stare. 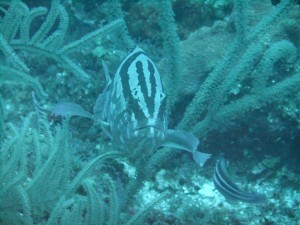 Much scarier than the Barracuda is the dreaded Lionfish. 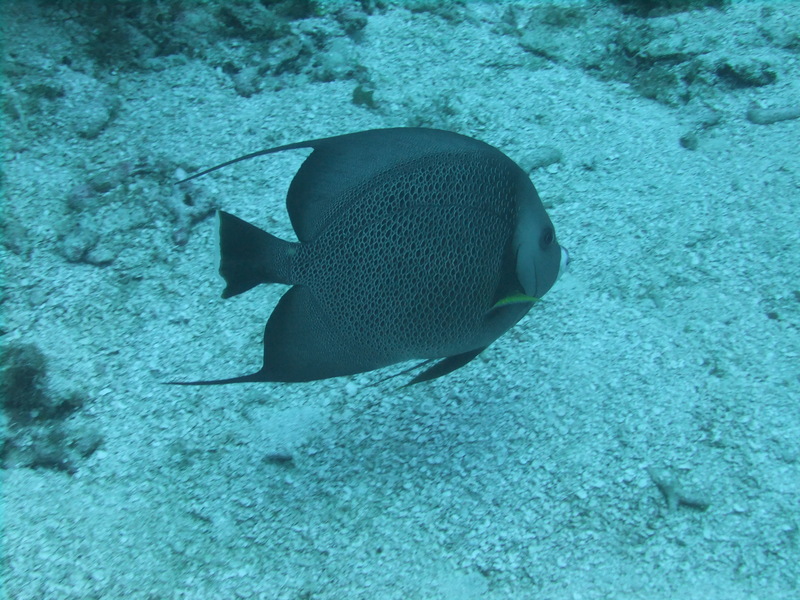 This fish is a major buzz kill not because of the risk of getting stung by its venomous spines (an encounter that will get you a painful ticket to the mainland) but because of its impacts on native populations of fish. Lionfish are originally from the IndoPacific but were introduced to the Caribbean from Florida (most likely having escaped from an aquarium during a hurricane). They lack natural predators in the area and have explosive reproduction patterns so their populations are out of control. While their spines aren’t particularly dangerous to humans who keep a wary eye out, native fish succumb easily to their venom and their populations are severely impacted. Unfortunately, every dive and snorkel we went on seemed to include at least one Lionfish sighting, this dive revealed more than 10. This invasive species is a hard one to kick and it is proving ever more resilient and productive. 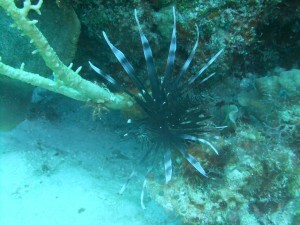 Efforts have been made to increase demand for Lionfish, a tasty food fish and the only sushi fish in the Caribbean. Dangriga is hosting a Lionfish tournament in August in hopes of reducing the local populations, perhaps overfishing can be molded to work in our favor for once.